Accenture’s vision is to improve the way the world works and lives. Through Corporate Citizenship, our programme focuses on environmental and social sustainability by bringing positive change to the communities in which we live and work. Through our flagship community investment programme, Skills to Succeed, our objective is to provide 3M people globally, by 2020, with the right skills to help them adapt and thrive in the digital economy. It aims to support vulnerable & marginalised populations to secure meaningful and lasting employment or to set up their own business. To achieve this goal Accenture work with a number of strategic community partners to achieve impact at scale, including Inner City Enterprise (ICE). ICE was originally established in 1991 and has built up a demonstrable track record in assisting unemployed people to establish their own businesses or create their own self-employment opportunities. It’s a well-supported fact that the long term unemployed including subgroups such as women and lone parents, people from migrant communities, older people, ex-offenders and recovering substance abusers, all struggle to find meaningful employment and so often look to self-employment as the only means of them re-joining the workforce and combating their own poverty and social exclusion. ICE offers varied supports specifically aimed at long term unemployed, such as assistance with loan and grant applications, advice on company set up and tax registration and training workshops on areas such as sales and marketing. Accenture has partnered with ICE for over 4 years and in that time helped +80 individuals set up small businesses. Via our cash grant scheme, we also support the core function of Inner City Enterprise by part-funding an Enterprise Officer. In addition, through our MD Sponsor, Paul Pierotti, and Accenture volunteers, we provide business advisors and mentors who can offer one to one specialised support to clients, and skilled volunteering opportunities through workshop facilitation such as sales, innovation and social media. For the first time in 2018, ICE also became the Irish implementation partner for the globally well-established Youth Business International (YBI). This programme specifically helps 18-30-year olds start their own business, delivered through a month-long training course that builds critical skills and helps young people enter the job market. Accenture is supporting ICE with this new programme by running tailored workshops, led by senior Accenture SMEs. In addition, our digital learning platform, Digital Skills, accessible by all participants, provides additional bite-size learning on topics such as digital marketing. “Our work with Inner City Enterprise is focused on helping these small businesses build better client services and communicate them more effectively. That is what I love about it. You see the attendees adjust their businesses in real time to deliver direct, tangible benefits.” Paul Pierotti, Accenture MD and ICE leadership sponsor. Over 30 Accenture employees have been directly involved this year alone. Through our partnership, Inner City Enterprise has supported unemployed people to start their own business and the provided the critical follow on-services that help the start-up businesses succeed. “Our day in Accenture as part of the Young Entrepreneurs training was amazing. The facilitator was great, very knowledgeable and interesting. We learned practical skills around sales and I found the day really useful. As an added bonus we got a tour of the Dock, the innovation space in Accenture, and on top of everything else, a lovely lunch was provided. 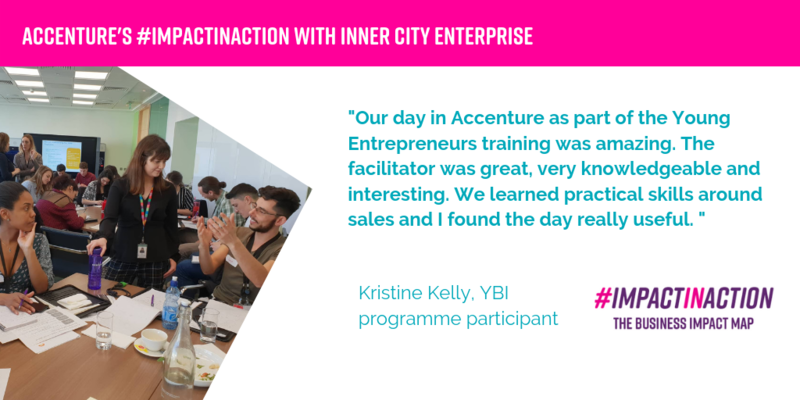 I can’t thank Accenture and ICE enough for this opportunity.” Kristine Kelly, Youth Business International programme participant. Since 2012 ICE has registered over 2000 new clients and supported over 800 new businesses set up. 60% of these businesses are still in operation after two years of trading and a further 15% of these clients have returned to full time employment or education.